DSM chief executive Feike Sijbesma kept his promise and helped feed a nation, finds Liz Mellon. In January 2007, 47-year-old Dutchman Feike Sijbesma attended his first World Economic Forum (WEF) in Davos, Switzerland. Just weeks before, his employer Royal Dutch State Mines (DSM) had announced that Sijbesma would be its next chief executive. DSM – once a coal-mining firm – was, at the time, predominantly a European industrial chemical company with divisions in food ingredients. But all that was about to change. On one snowy afternoon, Sijbesma sat in on a private WEF breakout session during which African leaders criticized Western food aid shipped to their continent for the last 50 years. Western food is full calories, which keeps people alive, they acknowledged. But being largely devoid of micronutrients, it leaves people unhealthy and unable to reach their full physical and cognitive potential. It is a practice that keeps people going, they argued, but leaves them unable to meaningfully contribute to Africa’s economic growth. Following the session, Sijbesma approached one African president who had spoken most passionately. He introduced himself, explained that DSM had a division in nutrition, and promised to help solve the issue. The response from this president was a sceptical “sure you will”, as he had heard it all before. Undeterred, and inspired to ‘Do Something Meaningful’ (the DSM initials have been repurposed), Sijbesma approached the United Nations and the World Food Programme (WFP) to ask how DSM could help. This was well before the ‘public private partnership’ concept had become entrenched in development vernacular, so DSM was forging new and difficult ground. Yet DSM persisted and signed its first memorandum of understanding with WFP later that same year – a partnership that has now lasted a decade. These days, DSM helps ensure that the food WFP serves in its school feeding programmes and emergency relief efforts is nutritious, fortified with essential vitamins and minerals. Not only has DSM made its nutritional scientist available to the WFP, but it has invented specific products for WFP missions, such as MixMe sachets, which can be added in-situ in schools and homes. Over the years, DSM employees have raised millions in cash and in-kind contributions, and the firm has even seconded employees to WFP operations. During the last decade, this partnership has made it possible for tens of millions of African children to reach their full potential by ensuring that they receive not just sufficient calories, but also vital micronutrients. Post-2007, DSM started other nutrition initiatives in Africa with affiliated organizations, such as Sight & Life, working on vitamin A intervention; Partners in Food Solutions with General Mills, Cargill, Buhler and Hershey’s; and partnerships with groups like Vitamin Angels. Yet DSM wanted to do more. It wanted to facilitate nutritious food production in Africa, using African feedstocks produced, by Africans for Africans, to break the continuous cycle of undernutrition, foreign aid and economic stagnation. CHAI and the Government of Rwanda invited DSM to build a nutritious food plant in the Rwandan capital city of Kigali. At the time, some 38% of Rwandan under-fives suffered from severely stunted growth due to malnutrition. The Government of Rwanda was looking for solutions, and DSM was the organization they believed could deliver. DSM first looked for strategic partners to help finance this new venture. Unfortunately, by traditional corporate financial standards, investment would not deliver the near-term financial returns that most private sector organizations require. Additionally, this venture was not without risk. While Rwanda is now politically stable, Africa historically has been a difficult place for Western organizations to operate. And, being landlocked, Rwanda presented some acute logistical and basic infrastructure challenges. DSM had to find an alternative solution. Following a ‘road show’ to potential investors, including governmental agencies, development banks, private equity funds and NGOs, DSM reached an agreement in principle with the World Bank’s International Finance Corporation, the Netherlands Development Finance Company, and the DFID Impact Acceleration Facility. Negotiations over contractual terms on the investment took two years. Finally, in July 2015, agreements were signed in Amsterdam – and Africa Improved Foods BV (AIF) was born. Soon thereafter, Africa Improved Foods Rwanda was created, with AIF as the 91% shareholder and the Government of Rwanda as a 9% shareholder. The Government of Rwanda made in-kind contributions of land in the Kigali Special Economic Zone, Nyandungu, in return for its shares, and committed to using any profit sharing to underwrite the costs of feeding programmes in Rwanda. maize and soya) manufactured to international quality standards. Following a year of construction challenges, the plant reached mechanical completion in December 2016. In Q1 of 2017, the first shipments of food began rolling out of the facility, and the plant continued to scale up. The total cost of construction was approximately US$60 million. The plant has been successful in manufacturing to the highest quality and safety standards. This has required training, of not only hundreds of workers in the plant who do not have a history of working in modern manufacturing operations, but also of thousands of smallholder farmers who are being taught how to better harvest, store and transport their crops. The plant currently employs 315 Rwandans in its operations, and employed over 600 during the construction phase. One of the most important aspects of this venture is the commercial operation. The venture would be impossible without the support of the WFP, which has signed a long-term deal with AIF Rwanda for a supply of super cereal for use in its own school-feeding and famine-relief efforts. Today, AIF Rwanda cereal is already helping feed those devastated by famine in Sudan, South Sudan and Somalia. Another important commercial relationship is with the Government of Rwanda’s Ministry of Health. AIF Rwanda supplies the government with Shisha Kibondo, a fortified porridge flour that the Government of Rwanda purchases to use in its own school-feeding programmes and relief efforts, distributing it to more than 97,000 of the country’s most vulnerable children for free. Finally, and as a key differentiator and core to the venture’s sustainability, AIF Rwanda is selling into the Rwandan and Ugandan commercial markets. Products like Nootri Mama and Nootri Toto can be found on supermarket shelves in Kigali and other cities. The product is high-quality and highly nutritious, and currently sells for about a third of the price of comparable imported products. The profitability of this venture is critical to its sustainability. 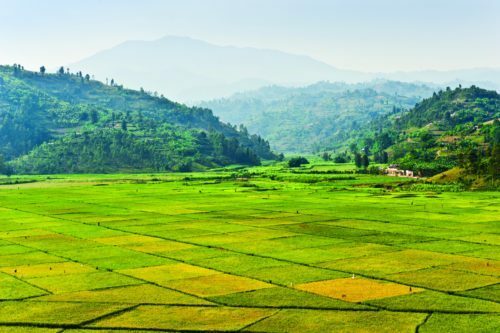 And that sustainability is critical to the African beneficiaries – the Rwandan employees and the Rwandan smallholder farmers – who rely on AIF Rwanda for safe, affordable, nutritious food, for jobs, and for a stable market for their crops. This venture is not philanthropy. It is a purpose-driven, for-profit enterprise that is replicable and scalable. DSM estimates that by 2022, AIF Rwanda will have contributed $36 million to the Rwandan and regional economy, through spending on local feedstocks, energy and labour. No AIF Rwandan employee should ever live below the national poverty line, and currently workers earn between 28% and 38% more than they did with their previous employers. AIF Rwanda intends to launch a ‘Made in Rwanda’ campaign that will serve as the basis for increased international demand and sales. It is estimated that AIF Rwanda will contribute between 5% and 10% to Rwanda’s export sector, securing US$ 40 million in foreign exchange for Rwanda per year. Most importantly, the goal is to reduce childhood stunting in Rwanda – from 38% to 32% by 2020 – by exclusively using AIF Rwanda products. AIF Rwanda is not the end. It is, as they say, the end of the beginning. DSM and its partners are in the process of finalizing negotiations with the Government of Ethiopia to build a similar facility in Addis Ababa for Ethiopian consumers and regional beneficiaries. This model can be replicated anywhere, to create an ecosystem that ends ‘hidden hunger’, allows all children to reach their full physical and cognitive potential, and spurs economic growth through creating a manufacturing base. It also facilitates farmers to adopt better technology and practices increasing productivity, yields and profits, and helps enable social stability. African companies, employing Africans, using African crops, to feed African people. It is the first glimmer of the end of international aid. It is also a promise kept by a young chief executive on a chilly winter afternoon in Switzerland more than ten years ago.